landlocked / deadbolt / dust bowl / house in the middle. We read the entire list at the ceremony. After all, we were so careful about getting everything right, stuck on the word love for a day—love, like the failure of the word lung, like mineral. A grassy kiss against teeth. Grinning badly by a cactus. The blood dog’s bite against your thigh. Finally we settled: a hand in a room full of hands. The speaker relates the content of the vows in barren, claustrophobic terms in the first sentence. The poem then proceeds to convey a gentle yet disengaged (grassy) kiss and the obsession with the word “love,” which fails to adequately name what actually passes between the speaker and her addressee, just as “lung” and “mineral” fail. The nature of these words’ shortcomings is unclear; perhaps this is true for the speaker, attempting to articulate and define the intangible. The final sentence simultaneously evokes mundaneness and eroticism. In the morning, I fill the counter with crab legs. ready for an afternoon feast. I keep my hands full. Pass your name with salt over burners. The image of crabs “crawling and tangling” in the hair of the dead self while the living self moves about, keeping her hands full, expresses a paradox: to balance the numb, assertive, and pragmatic self, there must necessarily be something dead and plain in sight. One cannot have it a single or solitary way. In order to work through grief (to do what must be done in the everyday), there must be a sort of active separation or detachment. In fact, this separation, resonating throughout the chapbook, lays bare pain and regret in a stark clarity. The matter of fact line, “I step over her and fry an egg,” shows the speaker both ignoring and accepting the lying form as part of her environment. There’s triumph in these lines, as well as dejection. Aside from Poli’s effective use of a consistent system of symbols and place, The Egg Mistress contains multiple examples of deep, vivid imagery. The poem “I Hide the Core Heap Under the Bed” begins by describing traces of apple-flesh and peel: “Balsa hands and / red sugar on hot fingers: / you used to have a hold on me.” The third line reads like a line from a love song, transplanted and equated to the vestiges of the apple. The traces of the hold are still apparent. The speaker recalls making love “under black lights” with a sense of violence and shame; she recalls the tenderness in her lover’s brushing lint away from her mouth—no more. Finally, the poem ends with the speaker recalling an intimate line, “Let me melt, I always said. / You fed me apples in the morning. / You told me not to cry and fed me apples.” The inclusion of these lines, reminiscent of cliché, ring sincere in the face of the speaker’s bereaved state and Poli’s thorough depiction of gestures and images contained within the poem. The Egg Mistress can be taken as a layered sequence; each poem and prose poem feels a fragment, part of the whole. The speaker’s consistent tone also unifies the chapbook (we assume these poems have a common speaker). Through several rereads, one gains an even clearer sense of Poli’s intent—to tell the complex story of a relationship, or relationships, through several complex poems, able to stand on their own while complementing one another. There’s also a renewing joy of discovery, of surprise, inherent in this collection, despite the despair and strangeness woven into this book. And part of this joy comes from poems that defy easy explanation or expectation—handled with a level of dexterity and intelligence and care, evident of Poli’s poetic maturity. Poetry is the universe that surrounds the tiny, rocky province of prose; it’s where we learn that our linguistic laws are relative and artificial. This frustrates people – it intimidates and annoys them – and it has given the publishing industry license to ignore poetry (especially the chap-book) more so than literary fiction or even the short story. The impression, perhaps justified, is that people have no time for poetry, ironically, because it so concise. 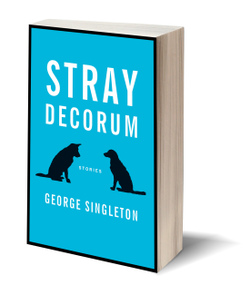 Novels – even big, Franzian leviathans – teach us how to read them, and even the experimental ones count on the reader’s familiarity with the quotidian world – light and shadow, gravity and magnetism – in order to highlight their departures. The physics engine of prose is easily understood; being alive qualifies you to read it. Does anyone even know how to read poetry? When I was in graduate school, I often asked professors this question. The answers were highly gendered (though, one hopes, not wholly representative). A male professor told me that reading poetry was about mastery – overpowering the ambiguity and fluidity of poetry by bringing the rigidity of theory to bear on it, binding it with context, biography and history. To read a poem was to break it, to domesticate it, to choke the life out of it. A female professor suggested something nearly oppositional – acknowledging the bewildering power of poetry, surrendering to it. To read a poem was to drown in it. But repetition is not understanding. Not yet. So, something has to be done – one needs a strategy, or at least a tactic. Which will it be, then, murder or suicide? First, there’s Murder: Poems are not parallel universes, like ghosts or neutrinos they do touch our world at certain points, however delicately – that’s where we’ll set the hooks. The epigraph is often the poet’s throat, bared and thrust at us. Larsen’s Godard taunts us: “When you see your own photo, do you say you’re a fiction?” This is the artist’s double-game, the representational uncertainty principle: when we think Godard is making a film, he’s giving us life; when we think he’s documenting, he reminds us – with the frame, the jump-cut, the montage – that he’s not. An irony: in this old slippery spot we set a hook. This is one way to read Larsen – to be one more predator, chasing her down the corridors of the Louvre with a camera and a gun, to say with cold detachment that you’ve won. But Larsen’s poems aren’t disarmed or domesticated (as even the stateliest sonnet has a little feral blood in its veins). You cannot kill what’s wild about them (although I’m sure you can exorcise it from your own reading and keep your own house clear). But if it’s communion you want – be it with demons or spirits – then murder won’t suffice. In Larsen’s hands (so to speak), Godard’s mise-en-scènes become a labyrinth by Borges, signs trembling between a strangle symbolism and a frightening emptiness. It reminds me of Douglas Gordon’s “24 Hour Psycho” as it manifests in Don DeLillo’s Point Omega – a film requisitioned, manipulated and transposed into words, so that we can see it, deeper and clearer. 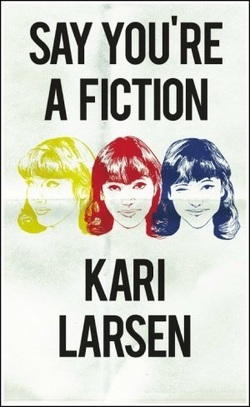 But where DeLillo’s language is cold and dead, Larsen’s crackles with dark wit. She knows and loves the game. She has a perfect sense of how to haunt a collection with phrases that return, slightly more twisted each time. So what is creative flash nonfiction? 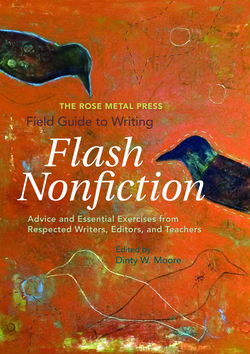 Dinty W. Moore, editor of The Rose Metal Press Field Guide to Writing Flash Nonfiction, works toward a definition in his introduction to the volume. He is well positioned to do so, having established Brevity, an online journal of short literary nonfiction, more than sixteen years ago and having edited numerous flash nonfiction essays. Moore’s writing preferences indicate a willingness to relinquish a degree of control in the writing process. These preferences are apparent in the selections included in the volume. Readers familiar with Moore’s book The Mindful Writer will see how those preferences play out in the writing of flash nonfiction. Working within the frame of 750 words or less, the writers of these essays jump immediately “into the edge of the fire,” to use Moore’s imagery, “getting to the fire” as quickly as possible. The authors write with concise language using the same elements, of course, of other literary forms, but making voice, verb tense, sentence sound, and mood serve this extremely short form in the most expeditious way. The form, then, promotes a sense of the immediate and the personal. All of the 26 authors presented are editors and instructors, as well as writers of the brief form. A flash nonfiction prompt follows each author essay, followed in turn by an essay example. This allows the reader to see the application of the writing idea(s) the author offers. Though not all of the applications were readily apparent to this reviewer, Brenda Miller’s “I’m sorry” essay made the application highly visible. She demonstrates how the recall of a single object lead her into a deep emotional response and understanding of an event in her past. Her essay approaches, yet manages to avoid, a self-pitying wallowing.Anne Panning finds “thingy-ness,” that is, concentration on ordinary, everyday objects, useful in forming flash nonfiction. Her first essay shows us how a small object or part sometimes stands in for the whole and can be used “as a means of reaching something much larger.” Her final essay, “The White Suit,” is one of the most poignant in this volume. In Lia Purpura’s essay we are directed to all things miniature, from dollhouses to Fabergé eggs to Chihuahuas to Chopin’s Preludes. Miniatures, she discovered, cause us to experience time as compressed. In viewing certain objects, such as miniature railroads, the smaller the objects, the more detail we notice, such as the lettering on a tiny boxcar, or the spatial scenes enclosed within an egg. When Kyle Minor begins his essay with “We begin with the trouble, but where does the trouble begin? My uncle takes a pistol and blows his brains out,” we don’t know where he will lead us. Minor himself may not have known where his essay would take him. He seems to meander back and back in time, until he has lead us into the Garden of Eden. His exercise asks us to play with the element of time. The question of where we begin is only one of many choices we make for a piece of writing, he says. In “The Sounds and Sense of Sentences” Barbara Hurd quotes Virginia Woolf: “Style is a very simple matter: it is all rhythm. Once you get that, you can’t use the wrong words.” Contrariwise, Hurd states, “Aristotle knew that when music satisfies, it’s not just because we like how it sounds, but because it goes somewhere.” Her writing exercise advises you to copy favorite sentences of authors you admire and post them around the house. “Read them aloud, slowly and often. Then try imitating each of their rhythms and structures.” Listen for how the rhythmic pattern of a sentence does or does not propel the sentence sense forward, she advises. In her second essay she speaks of silences and pauses in action, such as the way blizzards shut everything down, or the functions of rests in musical scores. Judith Kitchen writes on digression, and Ira Sukrungruang on using the “You” instead of the “I” in memoir. Aimee Nezhukumatathil wants you to take a plant, an animal, or landscape about which you know very little, research it, and then do “the fun part: expand each fact just enough to create an original and surprising rendering of the subject at hand,” trying to evoke a distinct mood. Norma Elia Cantu steers us toward the use of shifts in tenses. She writes, “In my autobioethnographic writing I often blend the tenses in a piece to take the narrative to the past and situate it as a NOW event. I am remembering an event at a fiesta in Spain in the 1980s and comparing it to the next time I was at the fiesta in 2010. In this way, I can shift between what it was like years before and how it is in 2010; but as I write about it from the vantage point of what I call ‘the writing present,’ the spring of 2011, I am allowed to insert a future tense as well.” For her prompt, she asks a writer to think of a photo of (him)herself at a given age and ask: Who is taking the photo? What is the occasion? What are you sitting or standing on? If that child in the photo would talk to you, what would (s)he say? Then Cantu asks for a free-writing session, “letting yourself go wherever the writing takes you, answering the prewriting questions or not.” A next challenge is writing the exercise in different tenses, including the future tense. 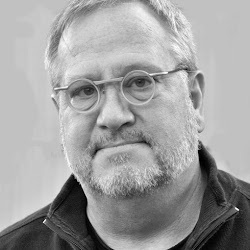 Robin Hemley’s essay arose when he accepted a challenge to write an accompanying piece for a friend’s series of photos of people running (i.e. late to appointments) and women idly “twirling their hair.” His essay concluded with explanations of the stadium and punctum (i.e. the point in the photo at which the decisive emotion, or “wound,” occurs), and of how we can bring these same elements to bear in an essay. “It’s the correlation between the literary imagination and the photograph that interests me, that inspires me as a writer,” Hemley says. For his prompt, he suggests students write about a given photo from one’s past. Then write about an imagined photo. Write so convincingly that your reader cannot distinguish which photo is fake and which is real. Moore presents so many ideas, approaches, images, methods, and styles in this volume. It’s a rewarding read, especially for the aspiring writer or for the teacher of the art of this miniaturized form. The collection carries us into newer modes of expression. We are free to explore them in order or randomly, like the crows seem to do on the beautiful cover of the paperback. A list of suggestions for “Further Reading” accompanies the collection. It was compiled by the editor, the contributors, and the press and includes such works as Flannery O’Connor’s Habits of Being, Lia Purpura’s On Looking: Essays, Simone Weil’s Gravity and Grace, Virginia Woolf’s The Death of the Moth and Other Essays, and a collection, Distance and Direction, by Judith Kitchen to whom this anthology is dedicated. The breadth of this list itself indicates the sobriety of intent the authors represent in this useful volume. 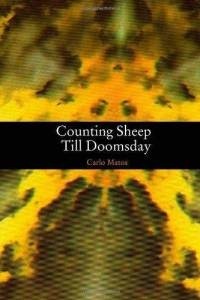 Carole Mertz has reviewed for the Page and Spine Fiction Showcase, The Christian Communicator, and the Long Ridge Writers Webletter. Her stories have appeared in various online sites, and in The Rockford Review, The Lutheran Digest, Mature Years, and a Whortleberry Press Anthology. Carole lives in Parma, Ohio, but grew up in Pennsylvania Dutch country. She likes to think her most unusual “claim to fame” is having once played a triangle solo with a symphony orchestra.